Sometimes in the political news you will hear the term ‘scapegoat.’ There will be some huge scandal, involving many people at many levels of government, all of whom are accused of engaging in illegal activities, obstruction of justice, immoral behavior, or other bad things. The press and the public will demand that something be done about it. Then, behind the scenes, the damage-control team will select one poor schmuck and find some way to put all the blame on him or her. The press will then have something to talk about, the public’s desire for justice will be satisfied, and all the rest of the scoundrels involved can self-righteously condemn the one who has been selected to take the blame. The poor person who gets dumped on by everyone is the ‘scapegoat.’ Many others are then able to escape punishment because all the wrongdoing is placed on the one. This concept of the scapegoat comes from the Old Testament book of Leviticus (see below). These verses come in the context of a much larger section which describes in great detail all the rituals that the priests had to go through in order to receive God’s forgiveness for the sins of the people. The proper clothes must be put on by the priests in the proper way, a goat and a bull must be slaughtered and the blood spread here and there in just the right way, a fire must be prepared and certain parts of the sacrificed animals are to be burned on that, and then, there is this part about the scapegoat. These are the kinds of chapters that people get bogged down in when they attempt to read the Bible from cover to cover. The material is difficult to understand, not very interesting, and can go on for many pages. One might well ask what any of that had to do with the forgiveness of sins. Proper garments, elaborate rituals, blood of animals, burnt sacrifices, and then turning a goat loose in the desert– what good does any of that do? Later in the Old Testament this gets even more confusing, because in other books these very practices are condemned by God as worthless. Whereas in the early books of the Bible there are many pages of commands and instructions from God on how to do these rituals and sacrifices, the later books of the Old Testament are filled with angry words from God condemning those very same practices. How are we to understand this? The answer has to do with the use of symbols in religion. Symbols are a part of life; shortcuts to communication. Golden arches on a road sign tells you there is a McDonald’s restaurant ahead, wearing a purple and gold sweater means you are a Minnesota Vikings fan, putting on a cheese-head cap says you are a Green Bay Packers fan, and a white check mark on your shoes tells the whole world you are wearing expensive tennis shoes. And what is a symbolic shortcut for us, is a primary means of communication for people who cannot read or write. When you go to church on Sunday morning there are printed bulletins and published hymnals to aid you in your worship, but those are helpful to you only because you know how to read. However, throughout Old Testament times and for much of the history of the Christian church, most worshipers in most places could not read. Therefore, in order for worship to be meaningful, it had to be primarily a visible event out in front for people to watch. It was a visible, and therefore by necessity, a symbolic, acting out of the truths of the faith. And so blood was shed to show the seriousness of sin, and priests were selected and wore special garments to symbolize their place as mediators between God and people, and sacrifices and incense were burned so that even certain smells would become a reminder of God’s presence; and, live goats were released into the wilderness so people could see that their sins were removed from the community and that sin should remain far from them. They could not read about any of this, but they could see it played out symbolically. God commanded all these rituals so that the people could see and learn and remember the faith. But it was never meant to be just a show. The symbols were to be symbolic of something else. And so later on in Old Testament times, when the faith and worship of the people became corrupted, the rituals became nothing more than a show, and, were even thought to be a guarantee of God’s presence and protection. The people, led by the priests, ignored and neglected the truth behind the symbols– the truth that they had sins that needed forgiving and that God was a loving and forgiving God who cared for them, but who also wanted their obedience. God wanted them to live in the ways of justice and peace. What God did not intend and did not want was that the people would use the rituals in an attempt to buy God off, and then sin without worry, dealing with each other unjustly and oppressing the poor and needy. By the time of the prophets, all these rituals and symbols had become no longer an aid to faith, but a barrier to pure faith and devotion. It was for this reason God said he now hated their sacrifices and rituals. He hated them because they had become nothing more than a symbol, and the truth behind the symbol had been completely forgotten. What had become a call to obedience had turned into a license for disobedience; what had been a sign of God’s love and mercy, had become a way to take advantage of God’s love and mercy. By the end of the Old Testament, the symbols were useless, the system was broken, and something new was needed. Jeremiah told the people that God would make a new covenant with them. Centuries later, when Jesus broke bread with his disciples on the night he was betrayed, he picked up on Jeremiah’s words and said “This is the new covenant in my blood.” No longer would it be the symbolic shedding of an animal’s blood. Now God himself, in Christ, would shed his own blood. Now it would not be just a symbol of the cost of sin, but now, in person, all would see the pain that our sin causes in the very heart of God. No more would there be sacrifices of lambs, for now the perfect lamb of God was sacrificed for all people of all time. There are deep and meaningful symbols of this from the beginning of the Bible to its end, and all this one meditation can do is point out that it is there. But in the death of Jesus on the cross, the symbol becomes the reality. 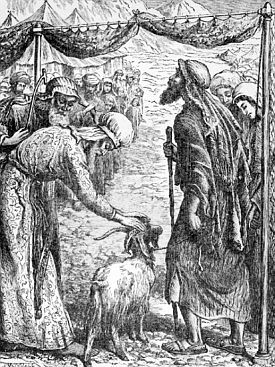 Leviticus 16:5, 8-10, 20-22 — (Aaron) shall take from the congregation of the people of Israel two male goats for a sin offering, and one ram for a burnt offering… Aaron shall cast lots on the two goats, one lot for the Lord and the other lot for Azazel. Aaron shall present the goat on which the lot fell for the Lord, and offer it as a sin offering; but the goat on which the lot fell for Azazel shall be presented alive before the Lord to make atonement over it, that it may be sent away into the wilderness to Azazel… When he has finished atoning for the holy place and the tent of meeting and the altar, he shall present the live goat. Then Aaron shall lay both his hands on the head of the live goat, and confess over it all the iniquities of the people of Israel, and all their transgressions, all their sins, putting them on the head of the goat, and sending it away into the wilderness by means of someone designated for the task. The goat shall bear on itself all their iniquities to a barren region; and the goat shall be set free in the wilderness. This entry was tagged symbols. Bookmark the permalink.